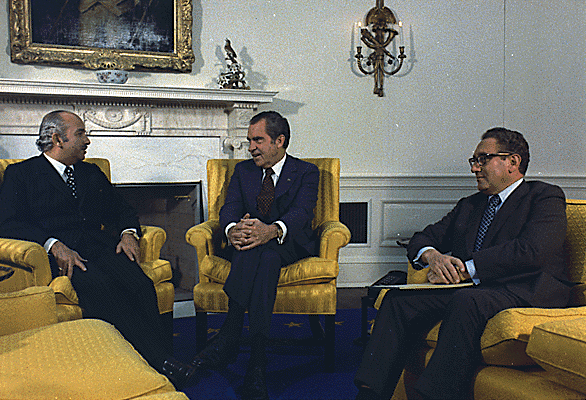 Discuss the Nixon-Kissinger reaction to the 1973 Arab-Israeli war. What issues were at stake, both within the region and the wider Cold War? How would you assess the success and/or consequences of Nixon and Kissinger’s handling of the Middle East crisis? The 1973 War between Israel and the Arab nations of Egypt and Syria is directly related to the Six-Day War that took place six years earlier. While the actual attrition is restricted to the middle-east region, the conflict has had broader implications for the then existing world order. Also known as the Yom Kippur War or Ramadan War, the reasons for the initiation of the war are not purely local. In other words, cold-war tension was palpable during the war as a result of the United States support of Israel and the U.S.S.R.’s support of its rivals. Richard Nixon (the President) and Henry Kissinger (a senior member of the Nixon Administration) have had significant roles to play in the manner in which the war eventually played out. Both Nixon and Kissinger dealt with the situation in a cautious and diplomatic manner. The Middle-east region offered economic advantages to its trading partners due to the abundant energy resources available in its terrain. More importantly, it is of strategic importance to both the super-powers, as maintaining dominance over the world order is not possible without controlling the region. By the end of the military conflict the cold-war power alignments had been altered. Egypt’s pre-war leaning toward the Soviet Union had weakened as a result of the war. The war also brought to light Syria’s support for Arabs. By the end of the war, popular cynicism of the Israel government reached its peak both domestically and internationally, leading to the resignation of top leaders. On a more positive note, it had become the United States’ responsibility to ensure peace in the region; as a result of its increased dependency of resources in the Middle-east.